I am totally enjoying myself with Mona and the rest of the fabulous designers as their guest designer for November! I do hope you will visit CR84FN and check out the great creations the designers have made this week. You will be totally inspired! I used lots of techniques when making this card. First, I want to let you know where I got this pretty cake stamp! It is part of the Cakes2Build (Stamps of Life) stamp set. I stamped the cake in black and then covered the entire cake with Glossy Accents. After it dried, I colored the little flowers and roses with a Copic Marker and then stamped the centers with Cotton Candy Stickles. I was trying to get that fondant icing look going! I've been watching way too many food challenges on The Food Network! I stamped the cake stand in silver ink then I "glittered" it. I then covered it in Glossy Accents! I made a frame with pink & black paper around the cake using the Spellbinders Label 10 dies. Die-Namics Rolled Flower die (My Favorite Things) and made a pink rose. I found the green felt leaves in my stash! This rose ended up looking very similar to the stamped roses! Yeah! It added just the right touch to the bow! 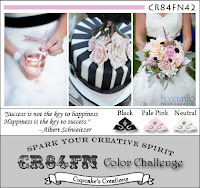 The sentiment is stamped with the Stampin Up stamp set-Create a Cupcake. The Oval and Scalloped Oval punches are also Stampin Up. I finished the card by putting black pearls in the corners. Beautiful card, love the glossy cake, and the beautiful rolled flower! Mackie, this is beautiful - i love the fantastic sparkly cake and those little pink flowers are so cute. The flower and ribbon are the perfect touch too. Beautiful cake! Love the the yummy flowers too! Adorable card! Very pretty Mackie! What a scrumptious looking card! Love the shimmery cake stand and the beautiful rolled flower! This is lovely mackie! Lots of sweet layers and glitz!!! Oh Mackie - this is just fabulous. I really like the shine, glitter and gloss on the birthday cake. And the pretty rose and ribbon - just super! Mackie, we must watch the same Food Network Challenges because I immediately thought of fondant! GORGEOUS effect on this GORGEOUS card! Really LOVE your window and the bow with the rose! Wonderful card, Mackie! Your cake is absolutely gorgeous and so are all the fab details on your card! What a delicious and so sweet card! What a fantastic card, love the fondant and the raised frame, Mackie. Your tiny little details are superb. oh your cake is absolutely yummy!! !